Read the press release about Ben and Zip. Download the press release PDF to share with colleagues. A tribute to friendship, boardwalks, and summer at beach, this storybook tells of Ben and Zip, two best friends who will keep readers laughing, cheering, and guessing until the very end when they are reunited after a rainstorm. Ben is short, but his best friend Zip is even shorter. One day while strolling along the boardwalk a summer shower blows in. There’s a clap of thunder, and Zip runs off in fear. Ben pushes through the crowd to find Zip, but being so short, all Ben sees are knees. He climbs onto a bench, but now all he sees are bellies. He clambers onto a picnic table, and all he sees is hair. Ben is sure he’ll glimpse Zip when he climbs to the highest point on the beach, the lifeguard stand, but Zip is nowhere to be found. 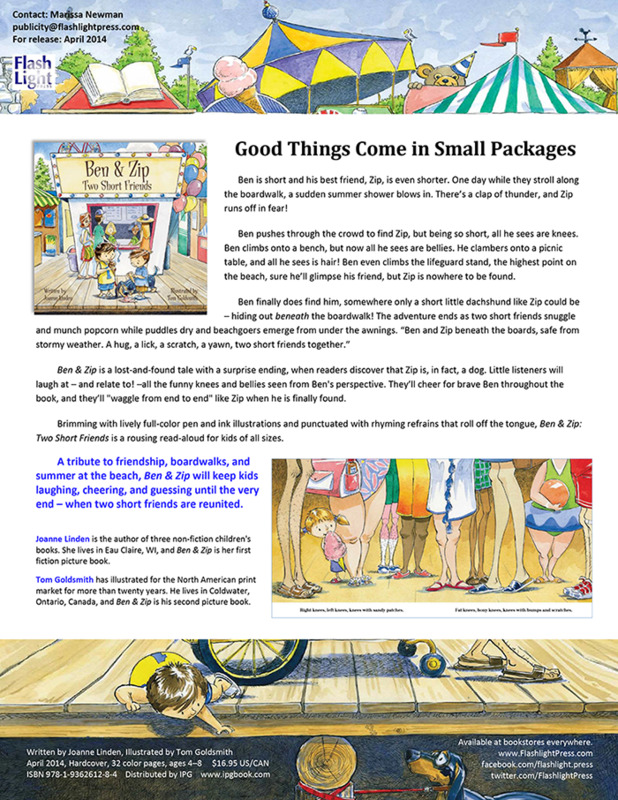 Ben finally does find Zip—his best friend and dachshund—hiding out beneath the boardwalk, and the pair snuggle and munch on popcorn while the puddles dry and the beach–goers emerge from under the awnings. A unique lost-and-found tale with a surprise ending, brimming with lively illustrations, and filled with rhyming refrains that roll off the tongue, this storybook is a great read-aloud for kids of all sizes. A beachside lost-and-found adventure, told from a kid’s point of view. “Ben was short. Zip was shorter. They skipped along the boardwalk toward their favorite spot....” So begins this tale of a small boy who loses his smaller friend on a beachside boardwalk. The text informs readers that they are headed toward a popcorn wagon, while the illustration, a low aerial view of the beach and boardwalk dotted with people, makes it hard to tell who’s Ben and who’s Zip. Suddenly the wind whips up, the sound of thunder fills the air, and Zip dashes off, disappearing into the crowd. Then Ben is shown, dressed in a bold yellow-and-blue basketball jersey, frantically searching for Zip with his parents in tow. At first, all Ben can see is the vista from his level: “[r]ight knees, left knees, knees with sandy patches. / Fat knees, bony knees, knees with bumps and scratches.” The image of this forest of feet and legs is delightfully funny; some legs are hairy and some are not, and one pair reveals a whopping sunburn above the sock line. Each time Ben climbs a bit higher to scout out from a better view, the prose turns into a humorous rhyming description of what he sees: bellies, hair, an empty beach (it has begun to rain). The well-paced watercolor illustrations, abundant with marvelous, comic details, are a neat complement to the adventure. This boardwalk frolic proves even small fries can solve big mysteries.